Topic: A hydraulic cylinder with integral pilot-operated check valve can present a considerable safety hazard for an unsuspecting person. 1. Why it is critical that everyone who works on and around hydraulic systems MUST be trained. 2. The potential consequences of allowing untrained people to work on and around hydraulic systems. 3. Why you should NEVER put compressed air in a hydraulic cylinder for any reason and the consequences for doing so. 4. Why cylinder manufacturers MUST provide clear, written service, repair, and troubleshooting procedures for their products. 5. Why all hydraulic cylinder design should include a mechanism to facilitate de-energization and verification thus complying with OSHA's lockout standard. A typical accident associated with this combination of valve and cylinder . . .
An oil-field service mechanic suffered a broken ankle and chest lacerations when he was struck by a "flying" cylinder rod that was inadvertently launched into the air by his colleague. A leaking hydraulic cylinder was removed from a machine to replace the seals (the approximate dimensions of the subject cylinder are 6" diameter and 8 stroke). It was dropped off at the cleaning bay to be drained and steam cleaned in preparation for disassembly. The cleaning bay attendant had developed a technique for draining the oil that remained in the rod-end of a cylinder. He simply attached a compressed air hose to the closed-end port, and used compressed air to push the cylinder rod out, catching the oil flowing out the rod-end in a receptacle. The estimated air pressure used was 180 PSI (12 bar). When the cylinder rod was fully extended, he disconnected the compressed air line from the cylinder port and discharged the compressed air to atmosphere. He failed to realize that the only air that escaped was the air that was stored in the lengthy air hose. He was unaware that the air did not vacate the cylinder because it was trapped by the integral pilot-operated check valve - after all, the cylinder port was wide open! It must be noted, that this was apparently the first cylinder that crossed his cleaning bay that had an integral pilot-operated check valve. He left the cylinder rod in the fully extended position, and went ahead and steam-cleaned the cylinder. It was subsequently transported to the repair shop with a forklift, and placed upon work stands that were approximately 36" high. A shop mechanic with no formal training in hydraulics was given the task of disassembling the cylinder. He had no idea that the cleaning bay attendant had extended the cylinder rod with compressed air, and that the compressed air remained trapped in the cylinder, even though the ports were open. He made several attempts at removing the stubborn rod-gland locking mechanism. In fact, he made several comments to his supervisor alluding to the fact that there appeared to be pressure against the gland assembly. However, he quickly discounted this theory because the cylinder ports were wide open. His determination paid off - he eventually managed to pry the stubborn locking mechanism out. However, what happened when it came out was not what he expected. The compressed air unexpectedly launched the rod out of the cylinder tube. It traveled several feet and struck the victim who happened to be walking by, knocking him to the ground. He suffered a broken ankle, and chest lacerations. When the cleaning bay attendant pushed the cylinder rod out with compressed air, he did not realize that the cylinder was equipped with an integral pilot-operated check valve. Consequently, the compressed air that he pumped into the cylinder could not escape without pilot-pressure. When the mechanic, with no formal training in hydraulics, was assigned the task of disassembling the cylinder, he could see that the cylinder ports were open and unrestricted. He had no idea that the block that was welded directly to the cylinder tube housed a pilot-operated check valve that trapped the compressed air. When he finally managed to dislodge the gland retaining mechanism, the compressed air discharged the cylinder rod and piston assembly at relatively high velocity. Left the cylinder rod in the same position it was when it was dropped off for cleaning. Delivered it to the repair shop. Secured the cylinder firmly to repair stands. Verified that there was no stored energy in the cylinder. NOTE: Since less than 1% of hydraulic systems conform to OSHA's standard for lockout with respect to de-energization, and since OSHA obviously DOES NOT hold the fluid power industry accountable for abiding by the lockout standard with respect to de-energization, this step cannot be accomplished regardless of whether a person is trained or not. Once the compressed air is introduced to a cylinder with an integral pilot-operated check valve, the only way to remove it would be to apply pilot-pressure through the live-end port. This task, in and of itself, is hazardous if it is not done by a suitably trained person. NOTE: I have heard of machinery manufacturers recommending that stored energy be released by screwing out the cartridge that contains the pilot-operated check valve. I STRONGLY RECOMMEND THAT YOU NEVER FOLLOW THIS RECOMMENDATION - IT IS EXTRAORDINARILY HAZARDOUS AND COULD KILL YOU. Once the untrained mechanic determined (by "gut feel"), which incidentally is all he had, that there was possibly trapped pressure inside the cylinder, he should have discussed the problem with his supervisor, and called the cylinder/machine manufacturer for advice. The first step in preventing this, and all types of accidents, is training. 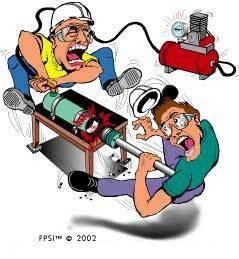 Poor skills, not poor people, are the root-cause of the majority of accidents associated with hydraulics. No person should be permitted to work on and around hydraulic systems without the proper training. Ban the use of Compressed Air for Disassembling Cylinders. While the task of disassembling and assembling a cylinder might appear to be simple, there are dynamics associated with the job that people must be aware of. Using compressed air to aid in pushing a cylinder gland/rod out of a cylinder should be banned. When the consequences of ones actions are unpredictable, the actions should never be taken. There are few actions/reactions that are more unpredictable than using compressed air to disassemble a cylinder. Cylinder manufacturers use numerous design configurations to retain the gland assemblies in round-welded cylinders. It is therefore critical that cylinder manufacturers provide clear instructions on disassembly and assembly procedures. It is equally as important that this information find its way into the hands of service personnel. If the disassembly of a cylinder is of such a specialized nature that only factory authorized personnel conduct the repair, then the manufacturer is obligated to make this clear in their literature. In addition, if special tools are needed to disassemble or assemble a cylinder, they should be listed in the service/repair literature. Appropriate cautions and warnings should also be listed. In one instance a cylinder manufacturer, when asked for a detailed breakdown by a mechanic, told the mechanic that the drawings were "proprietary information." However, the manufacturer included very specific instructions in their service literature that the cylinder needed to be disassembled and checked after a pre-determined number of hours. The net result, the mechanic went ahead with the recommended repair without the aid of proper instructions - it cost him his leg, and severe burn injuries. Find out before purchasing a cylinder if the proper service/repair information is available. If the information is proprietary why purchase the product? There are many cylinder manufacturers who will offer a helping hand with service and repair matters. Most accidents associated with hydraulics are treated as "mishaps" until, of course, there is an injury. Have your safety personnel investigate every incident associated with hydraulics, regardless of how minor it may appear, and dont give up until you determine the root-cause. Take corrective action immediately! Bring hydraulic safety out of the closet, so to speak. Less than 1% of Americas corporations discuss hydraulic safety in their safety meetings. Put hydraulic safety on the top of your "recognized occupational hazards" list. This accident, like most accidents associated with hydraulics, could have been prevented if the appropriate proactive safety steps had been taken, and people were properly trained. In the next Safety Topic, I will report another needless accident associated with hydraulics, that, as you will see, could have quite easily been prevented. In the meantime, do what you can to help people understand hydraulic safety. And, as always, you can always rely on our help. If you want a first-hand insight about hydraulic safety, plan to attend one our safety-based, hands-on workshops. Remember, if you dont get hydraulic safety from us, you will get it nowhere!